Surrounded by rolling mountains, Colonel Denning State Park&apos;s 273 acres of woodland is the perfect place to enjoy a little peace and quiet. With the 3.5-acre Doubling Gap Lake for swimming and boating in the summer and ice-fishing and ice-skating in the winter, a 52-site campground, volleyball, picnicking and trails for hiking, biking and horseback riding, it&apos;s the perfect place to bring the family and connect with nature. 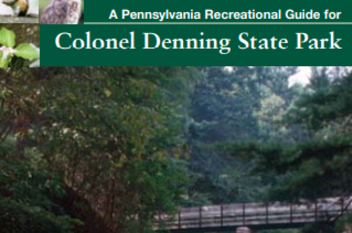 There are 3 trails totaling 3.5 miles to explore in Colonel Denning. 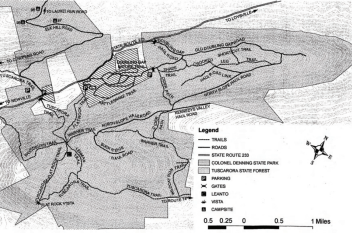 The most notable trail is the 2.5-mile (one-way) Flat Rock Trail. The strenuous, rocky climb leads to a 180-degree panoramic view of the Valley. 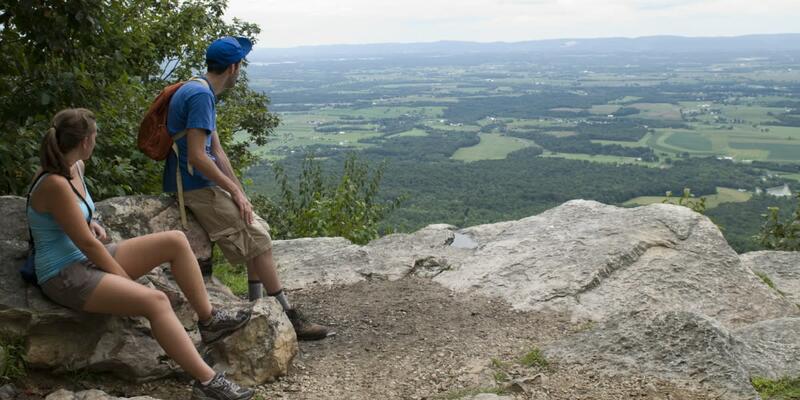 In the fall, enjoy the foliage and hawk migration from the Flat Rock lookout. The trail head is located next to the Visitors Center. The self-guiding Doubling Gap Trail is a one-mile moderate hike. 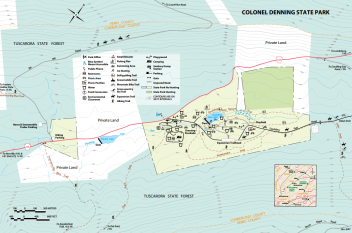 Colonel Denning is a trail head for Tuscarora State Forest and the 252-mile Tuscarora Trail. Trails in the surrounding Tuscarora State Forest are accessible from the park and when combined with those in the park provide 13 trails with 18 miles to explore. Cycling is allowed on paved roads through the park (approximately 1 mile). View additional Cumberland Valley bike routes. The park has an equestrian trailhead where riders can access the state forest trails. There are three courses to challenge your map and compass skills: beginner, intermediate and advanced. Trail maps are available at the park office or the nature center. The park has picnic tables and a limited number of charcoal grills. Pavilions are available for rent. 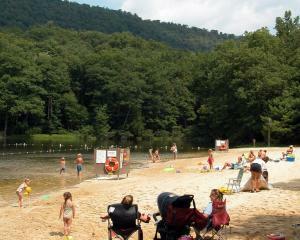 The lakeside beach is open from late-May to mid-September, 8 a.m. to sunset. View more places to splash around. The 3.5-acre Doubling Gap Lake has stocked trout. Department of Conservation and Natural Resources and Pennsylvania Fish and Boat Commission limits, seasons and regulations apply. Ice fishing is also available. View the top ten fishing locations. During established seasons, many acres are open to hunting, trapping and the training of dogs. Common game species are deer, squirrel, and turkey. Hunting is also permitted on the adjacent Tuscarora State Forest. Learn more about the Cumberland Valley&apos;s hunting areas. The avian inventory lists an impressive 100 species including several species of hawk, owl, woodpecker, warbler, flycatcher, and vireo. Regular forest species include Eastern Wood-Pewee, Scarlet Tanager, Veery, Wood Thrush, and Blackburnian Warbler. View bird watching hotspots. In the summer, look for interpretive programming and weekend events. Free and open to the public, dawn to dusk. The EE Center is open May – September 8 a.m.– 4 p.m. daily. Glide around on moderately hilly to mountainous terrain. Skiing is permitted on existing roads and trails. When conditions permit, a one-acre section of Doubling Gap Lake is cleared off for ice-skating and is monitored. Skating is permitted from 8 a.m. until sunset. Note: Due to the recent weather events, the Colonel Denning campground improvement project has been delayed and will remain closed until the work is complete. This is expected to occur sometime in the Spring of 2019. Until then, the reservations will remain closed. View additional campgrounds and RV parks here. Camping: The 52-site, tent and trailer campground is open April through December. Each site has a picnic table, fire ring, electric and water hook-up and is near vault toilets and a sanitary dump station. Pets are permitted on designated campsites. Make a Reservation.